A fine Japanese bronze ikebana vase decorated with a landscape of trees and mountains, a house with tiled roof in the foreground. A heavy cast formed as a single piece on tripod base with handles in the form of stylized elephant heads, or Baku, a mythological creature in Buddhist lore responsible for devouring bad dreams. Everyone should have one of these in their bedroom! Signed with a stamped mark of the bottom. Meiji period, circa 1880s. 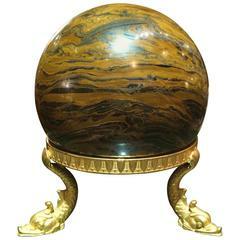 A handsome marble agate-like orb on a Italian neoclassical style gilt bronze tripod stand with three dolphin supports. 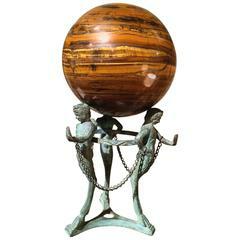 A beautiful agate orb on an Italian bronze 'Grand Tour' Pompeian style tripod stand depicting three faun herms with hoof feet. Lovely Verdigris patina. Japanese etched bronze vase with traditional nature scene.